Limit the use of color to 2 to 4 colors/shades. Use colors that will standout and will be easy on the eyes. Using a font color that does not contrast with the background color is hard to read. It is also not necessary to use different colors for secondary points. Using color for decoration is distracting and annoying. Maximum of fifteen slides per presentation is recommended. 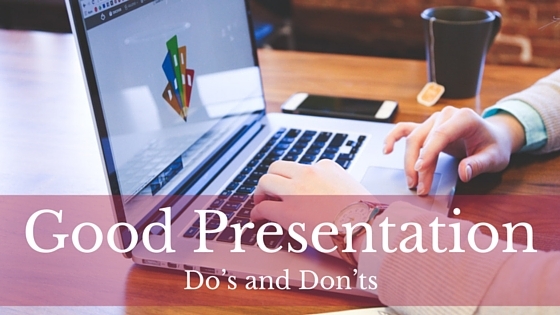 Too many slides will cause the readers to lose interest in your presentation. Express ideas visually rather than with words. You can use icons to convey your ideas. Highlighting content, using different colors and blurring background images to emphasize content in the background, are some of the techniques to express ideas. Use a grid layout. Put either the text or object in a symmetric flow. Don’t be scared to make use of the negative space in your designs. Choose design elements that support your mesasage. Avoid fancy borders and background graphics that aren’t clarifying your message. Always consider your audience while choosing graphics. Use background images that complement your text. Always remember not to use images that compete with your text. This will leave your text unnoticed. Use stunning beautiful images to inspire your audience, but don’t let them distract from your presentation either. Don’t be an encyclopedia, pouring out information onto slides. Keep it short and simple. If too much information is presented, too little will be remembered. Use a maximum of three points on a slide. There should be maximum three major messages. It should summarize the essence of what your audience wants to remember. One idea per slide is the best choice. Choose easy to read fonts and stick onto a font family. It is recommendable to use a font large enough to be read by the readers. Keep a consistent look throughout your presentation by using the same font, size and color.